After months of closely monitoring Er Shun, since she was artificially inseminated (AI) on April 27, 2014, Toronto Zoo staff have confirmed that despite showing early signs of a possible pregnancy through multiple urinary hormone tests, ultrasound examinations, and behavioural observations, Er Shun did not produce an offspring and was likely experiencing a pseudopregnancy. 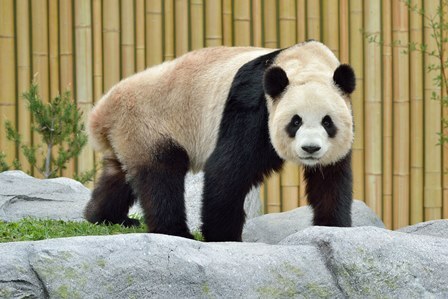 Er Shun’s hormone analysis showed an increase, over multiple days of urinary protesterone metabolites, which can be consistent with giant panda pregnancies. Zoo staff, while hopeful, were cautious due to Er Shun’s young age (six years old at the time of estrus) and having only experienced her first estrus period earlier this year. As there are no definitive pregnancy tests for giant pandas, Zoo staff continued to monitor Er Shun and regular ultrasounds were conducted by Dr. Cathy Gartley from the Ontario Veterinary College at the University of Guelph and Toronto Zoo veterinarians. Pseudopregnancies are not uncommon in giant pandas. The critical scientific research gathered over the last number of months by Toronto Zoo experts including a reproductive physiologist, veterinarians, and keepers will be shared with giant panda experts around the world in the hopes of ensuring the ongoing survival of this endangered species. There is a growing body of collaborative international scientific information on giant pandas and the Toronto Zoo is very proud to be contributing its expertise to this species. Toronto Zoo staff will now be monitoring Er Shun for signs of her second estrus. Female giant pandas are monoestrous, which means they have only one reproductive cycle per year for a period of only 24 to 72 hours. In 2015, the Toronto Zoo is hoping to see success in breeding Er Shun and Da Mao, and will continue to build on the extensive research from this year to improve the reproduction of this endangered species. The Toronto Zoo and the Calgary Zoo are part of a 10 year Giant Panda Cooperative Conservation initiative. The Toronto Zoo wants to acknowledge and thank the team of experts from the Chengdu Research Base of Giant Panda Breeding, Chongqing Zoo, Atlanta Zoo, Edinburgh Zoo, Memphis Zoo, Smithsonian National Zoo (Washington, DC) and the San Diego Global Zoo, who worked closely with us to collaborate and share their expertise to further understand this very complex species. Events and admission prices subject to change without notice.